The road from war to peace is a puzzling and uncertain one. To those who fight and die on it, it is seldom clear where the journey will end?and those responsible for finding the path are rarely more perceptive. Of the few signposts that exist, perhaps the most visible is the cease-fire. No war ends without one. Stopping Wars is the first attempt to catalog the reasons why some wars are so difficult to stop?even when both sides want the fighting to end.James Smith examines the problems encountered by protagonists as well as third parties attempting to achieve a cease-fire. Each chapter is devoted to a specific obstacle that Smith analyzes and then illustrates via in-depth case studies, drawing on such conflicts as the Iran/Iraq War, the Gulf War, and the Yugoslav wars. 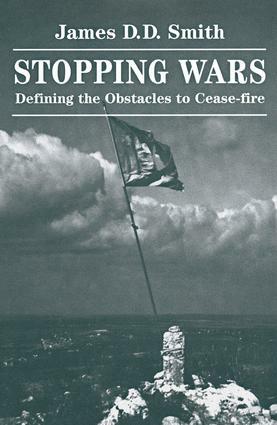 Smith assesses the role of third parties in trying to persuade people to stop fighting and examines what happens when obstacles to a cease-fire cannot be overcome.